I went on a nice sojourn out of my city this weekend and popped into a really cool gift store that got my creative, gift-giving juices flowing. Luckily, the pick for this month is readily available online, so fasten your seat belts and read on for a very creative “I’ve ALWAYS wanted that” suggestion. You know in movies when someone cracks open a bible and it’s actually storing something like a rock hammer or a drug stash or something more innocuous, like an engagement ring? 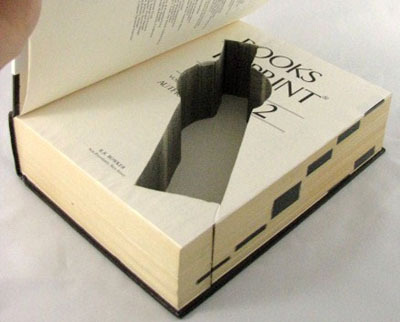 Well some geniuses decided to make those dreams a reality by selling real books that are sealed together and chiseled with a ‘hidden’ compartment so you can store your most precious goods. Or use the books as a way to conceal your remotes on the coffee table, in an ode to our screen-addicted 21st century ways. What I genuinely appreciate is the lengths these guys will go to satisfy their customers. They offer a wide selection of covers right from their website, so if you don’t feel like shopping a la carte in a real-life gift store, you can pick a book that won’t be totally out of place in your home. They also have a huge range of sizes – including some XXL coffee-table type books that’ll easily hold a trove of treasures. Want something just your own? Get a custom cutout, transform a specific book in your collection, or provide your own artwork and have it applied to a totally new book. The possibilities are really endless, plus, I’m always advocating for leaner greener gifts, and the folks at Secret Storage Books are all about recycling and extending a product’s life cycle. To learn more, visit their website, which allows you to convert prices into Canadian dollars for easy budgeting. Prices start at just $10 and go up to $95 for their in-stock products – totally reasonable as a housewarming, birthday, anniversary, or friendly gift.